Men’s basketball falls to Albany, Feb. 20. The Black Bears traveled down to Durham, NH to take on the Wildcats for the second time this season. 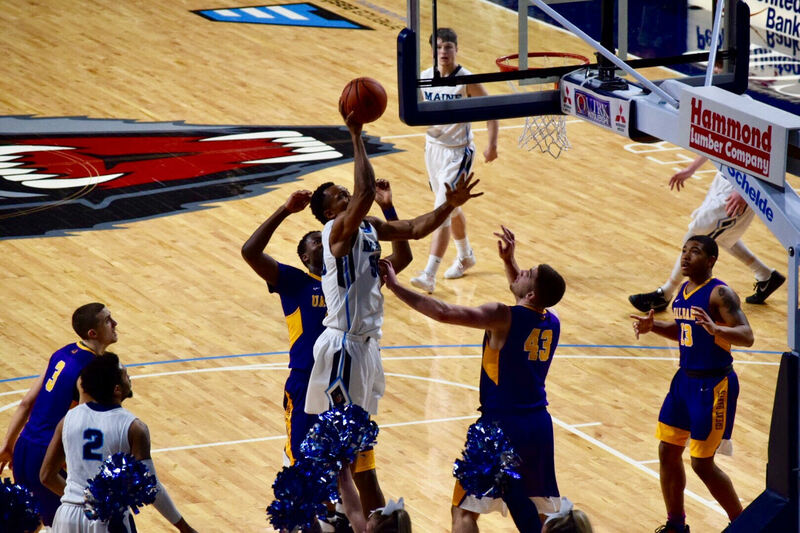 The first meeting between the two went the Wildcats’ way at the Cross Insurance Center and again UNH was able to grab a victory and sweep the series between the two in a 64-51 victory, pushing their record to 16-11, 7-6 in conference. The Black Bears fell to 6-23, 2-12 on the season. First-year Andrew Fleming led the way for Maine, scoring 16 points and pulling down six rebounds in 32 minutes of play. Vincent Eze and Danny Evans also contributed to the Black Bears scoring, with Eze providing 15 and Evans 14. Dennis Ashley and Austin Howard also contributed to scoring for Maine. The first half of action featured both teams trading buckets, with Maine keeping it close, led by Eze’s 8 points. Despite keeping it tight, the Black Bears only shot 29.2 percent from the field. With just under four minutes left, the Black Bears would cut the lead to two but not before UNH could rattle off a 14-0 run that was sparked by Jaleen Smith who finished with 12 points in the half. UNH would go into halftime up 35-19. The struggle to score continued for Maine in the second half. They only scored two points before the 14 minute mark, which allowed UNH to muster a 48-21 lead. The Wildcats would not look back. UNH held a 20-point lead for the majority of the half. Maine would continue to fight, as they have all season long, pulling off a 10-0 run. Seven of the 10 points on the run would come from Fleming, who buried a three after netting two free throws. UNH would miss a layup on the other end and Evans would gather the rebound and drain a 3-pointer on the other end to finish the game strong. UMaine will be back in action Sunday, Feb. 19 at 2 p.m. for the final home game of the season against the University of Albany Terriers. Maine dropped the first game at UAlbany on Jan. 22, 81-61. It will be Senior Day for the Black Bears, as they honor four seniors at the Cross Insurance Center in Bangor. The University of Maine men’s basketball team suffered a blowout loss 74-56 on senior night to the Albany Great Danes. The Great Danes jumped out to a 19-2 lead and never looked back. Maine had four athletes who play quality minutes suspended from their lineup and it cost them, as the Great Danes controlled the Black Bears in every aspect of the game all the way through to the finish line. Maine didn’t score a basket until Howard swished a jump shot to finally get the Black Bears on the scoreboard about six minutes into the game. It was a brutal first half for Maine on both sides of the floor, as they were out of the contest by the halftime intermission. Maine was held to a dismal 3-for-19 (16 percent) shooting performance and only shot 6-of-12 at the charity stripe to make matters worse. Albany took a 39-14 lead into halftime with them. Maine did show a lot of improvement in the second half by outscoring Albany 42-35 in the final stanza. However, it was a case of too little too late for Maine, as Albany was just coasting to the finish line and had the Black Bears right where they wanted them after the dominate first half. Second-year guard David Nichols led the Albany offense with a game-high of 20 points and four assists. Fourth-year forward Dallas Ennema chipped in 12 points and two rebounds off the bench in just 20 minutes of action. Second-year guard Joe Cremo and second-year forward Devonte Campbell netted 10 points each for the Great Danes respectively. Howard scored a team-high of 12 points for Maine to go along with three rebounds and two assists in their losing effort. Eze did all he could for Maine, recording a double-double with 10 points and 13 rebounds. Following the loss, Maine falls to 6-24 overall and 2-13 in America East play. Meanwhile, Albany improves to 18-11 overall and 9-5 in conference. Albany travels to Vermont next for a tough test against the first place Catamounts. Maine will close out its regular season campaign next Saturday, Feb. 25 at Binghamton with tipoff set for 2 p.m.